We lap up their culture, adopt their economics and are obsessed with the "special relationship". So why do British people have such a confused - even negative - view of Americans, asks writer Will Self. In 1976 my American mother took me to see Tom Stoppard's two short plays, Dirty Linen and New-Found-Land. The former was a rather prescient - or possibly only perennial - farce about libidinous politicos and a prurient press. Anyway, in New-Found-Land an older and a younger civil servant take it in turns to extol the virtues - cultural, political, natural - of the United States. At the climax of this competitive laudation, the younger civil servant drops his trousers to reveal stars and stripes boxer shorts, while crying out orgasmically: "Oh! My America! My New Found Land!" The laughter of the 1970s audience, I think, bore uneasy witness to the complexity of Stoppard's farcical vision. On the one hand, he was ridiculing a certain sort of British stuffiness that delights in putting down all things American as cheap, brash and overly sexualised. On the other hand, he was satirising the tendency for those self-same Brits to be politically in thrall to Uncle Sam, overshadowed by his mighty global reach. Almost 40 years on, not a lot has altered in our relationship with God's own country. The same ambivalence shapes our response to almost everything that comes across the pond. This ambivalence would be just comprehensible were it to follow some sort of regular pattern, with - following Stoppard - the cultural repulsion of British conservatives neatly offset by their political attraction and the British left responding contrarily by loving to rock 'n' roll, while decrying the depredations of what is now the sole global superpower. But in fact the British conception of America remains hopelessly confused. Love and hate are intimately co-mingled, and there is no single cultural artefact or presidential utterance that doesn't set off a dissonant chain reaction in the heart and mind of the average Briton, whatever his or her political standpoint. We've only to look back over 2012 at the way in which we have responded to events across the pond to appreciate quite how messed-up this relationship is. For a start there was the long run-in to the November re-election of President Obama. The spectacle of US democracy in action is at once ridiculed and revered over here. Looked at one way it is an unholy combination of demagoguery and plutocracy, what with its pork-barrelling politicians soliciting corporate donations for prime time television advertising. Looked at another, it has the folksy honesty of a town hall meeting writ very large indeed. Aspirants to public office in the US may well dissimulate, but in a wide-open cultural landscape, with only the occasional ironic outcropping, there's hardly anywhere for them to hide. Whatever the systemic failures of the US electoral process - and these are legion - and despite the fickleness, apathy and bigotry the electorate demonstrates, the view from the UK is that every presidential run-off has an epochal character. Somewhere in the troubling intersection between the American dream and the nightmarish patriotism engendered by Manifest Destiny, we sense their collective self-belief. What they do in the privacy of the voting booth genuinely matters, both to them and us. The protracted agony of the Syrian people as the Assad regime collapses in slow motion, the bloody stalemate in Israel-Palestine, the ructions in Egypt and the conniptions in Iran - throughout 2012, whenever our troubled gaze has alighted on one of these sore spots, we've been told that no balm can be applied until the voters in the bellwether states have made up their minds. Since the Suez Crisis of 1956 when the British government was told by President Eisenhower in no uncertain terms that for them the imperial project was over, our national self-worth has been predicated, in a large part, on a rearguard action to save face. Before WWII, ordinary British people only knew Americans as the gangsters and heroes from the silver screen. They were in for a shock. The first GIs landed on Britain's shores in 1942 and brought with them candy, Coca-Cola, cigarettes and nylon. The dilatory nature of the UK's relationship with the European Union often seems like the behaviour of someone stood up on a date, who cannot summon the willpower to walk away from the failed rendezvous and into the arms of the girl next door. And the American expression "date" is undoubtedly the mot juste here. For even in a year notable for its concerted attempts by the British to get our family jewels out of hock - what with the Diamond Jubilee and the London Olympics - the prevailing wind of change has continued to blow from the west. New Apple product launches and franchised television talent shows, Hollywood-financed blockbusters and new economic nostrums, the appetite for all things and ways American remains as ravenous now as it was when Bill Haley and his Comets rocked around the clock. And, as with all ravenous appetites, it can never be sated, only provoke a troubling indigestion. Since the staging of Stoppard's New-Found-Land, the great British public has increasingly had the opportunity to witness the object of their profound ambivalence in the flesh, as well as on celluloid. But far from greater intimacy leading to increased understanding, all those fly-drives to Florida and whistle-stop tours of Yosemite have only widened the gulf. For, once we've gotten over our initial amazement at the size of everything - from mountains, to prairies, to portions of food - a still more bewildering syndrome afflicts us. This can be seen most clearly with those British intellectuals - ranging across the political spectrum from the late Christopher Hitchens to the still extant Niall Ferguson - who, having paddled up the Potomac in their pith helmets, then went crazily native. Once established in the US, and with its objective reality restored to actual size, the British immigrant discovers its people. More specifically, while by no means able to form close bonds with all 311 million of them, he finds that such is their variety and contrariety, that there are plenty who are not only simpatico, but are also effectively indistinguishable from those he has left behind in Blighty. So, while from afar America may seem, to the Briton, a bewildering and Brobdingnagian phenomenon, close up and personal, the Americans themselves take on the more familiar Lilliputian lineaments of his own countrymen and women. 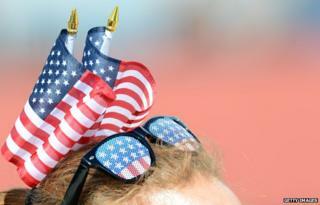 Why do some Americanisms irritate people? Of course, neither perception is anything but delusory. East is east and west is west, and while the twain may meet, this doesn't make them part of the same main. Despite their perverse habit of speaking our language fluently, Americans employ its vocabulary in radically different ways. Just as in spite of our wholesale consumption of their cultural product - including their neo-liberal economic policies - we British retain a pesky sense of our own national branding. I think, at root, the problem is one of mirroring. They say "aluminum", we say "aluminium", but both can be shiny and reflective surfaces. So, no matter how intently we examine the US, we cannot help but see our own features staring back at us. This phenomenon simply doesn't occur when we look at the French, the Vietnamese or the South Africans - all remain properly other. Only America and the Americans have this ability to derange us with their capacity to reflect our own image. Not that they do this intentionally, really, it's something we do to ourselves. And it follows that what we also do to ourselves is to relentlessly equate America with Americans, and the US government with its electorate - conflations we wouldn't dream of making in the case of the German or Greek peoples. Perhaps once we finally smash the mirror we will be able both to see the US for what it is, and face ourselves shorn of that post-imperial body dysmorphia that continues to make successive British governments punch above their weight on the international stage. Still, I wouldn't want to bet on it. Not, that is, while British civil servants still hide their stars and stripes pants beneath their pinstripe trousers.